The All-on-4 treatment concept is a prosthodontic procedure (i.e. replacement of missing teeth) that provides a permanent, screw-retained, same-day replacement for the entire upper and / or lower set of teeth with a bridge or denture. 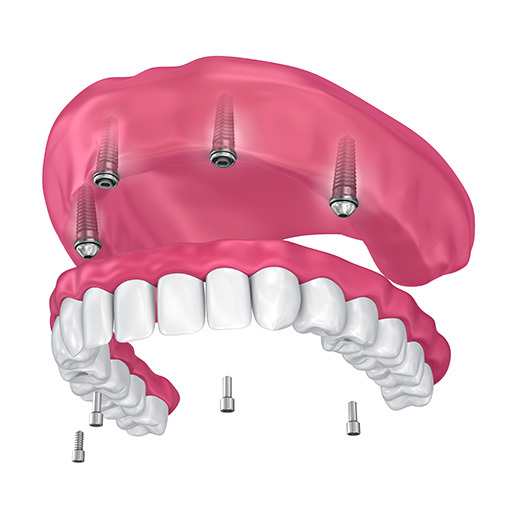 The procedure is best for patients with significant tooth loss or decay and for people whose bone loss in the jaw area prevents them from getting conventionally oriented (vertical) dental implants. Often, tooth loss is accompanied by loss of the jaw bone which poses the problem of reconstruction of the jaw bone requiring bone grafting. The All-on-Four technique takes advantage of the dense bone that remains in the front part of the jaws and by placing the two posterior implants on an angle to avoid the sinus cavities in the upper jaw and the nerve canal in the lower jaw.